TOP QUALITY PORTS WITH OPTICAL GLASS DOMES, AVAILABLE IN THREE VERSIONS. 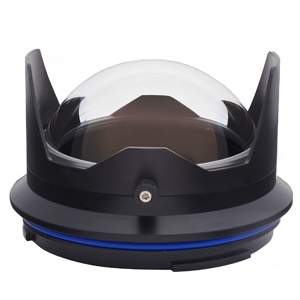 100MM IN DIAMETER, THE MOST COMPACT AND LIGHTWEIGHT OPTICAL DOME PORT SEA&SEA OFFERS. DESIGNED EXCLUSIVELY FOR FISHEYE LENSES. High quality BK7 crystal glass. Two different anti-reflective coatings are employed to optimize image quality, one for the exterior and the other for the interior of the Optical Dome. A multi-layer coating is used on the dome exterior and the interior of the dome is coated with silicon-dioxide to effectively suppress flare and ghosting. As a result, the refractive index of each port is reduced to less than 0.01% and the dome produces extremely high-contrast images.